Starting at 138th Street and running north to Mosholu Parkway, the Grand Boulevard and Concourse (as it is properly named) is the Bronx's grandest street, four and one half miles long. Designed in 1892 by farsighted engineer Louis Risse to give access to parkland to be built north of the city, it was finally constructed in the first decade of the twentieth century. The eleven lanes run between tree-shaded islands, originally meant to separate bicycle, horse and pedestrian traffic. 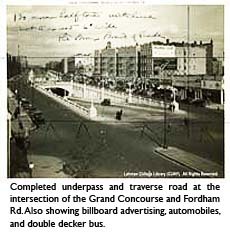 Cross-traffic at major intersections passes below or above the boulevard (an innovation borrowed by Risse from Olmstead and Vaux's Central Park). The Concourse is lined with apartment buildings, many of them brilliant examples of the 1930s Art Deco and Art Moderne styles. The newly-restored Heinreich Heine fountain at 161st Street marks the original entrance to the Concourse, which was extended southward in 1927.